Alec Bayer first became a Maui resident at a young age when his parents brought their family business to the island. Although they had to move back to the mainland a few years later, Alec returned to become a University of Hawai’i Maui student after completing initial schooling in Houston, TX. 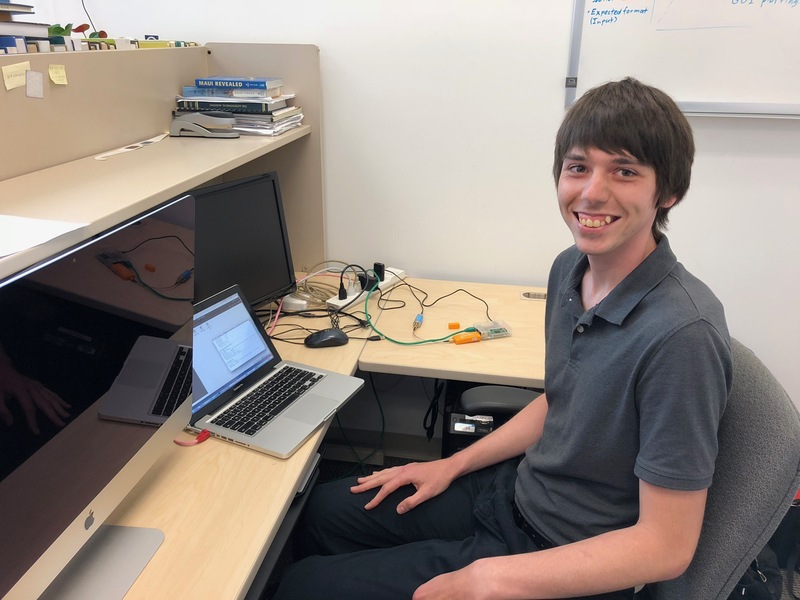 Alec has since completed an AS in Electronic & Computer Engineering Technology, and is pursuing a BAS in Electrical Engineering through Arizona State University’s online division. In his free time Alec utilizes his technical skills by repairing music equipment for music studios and venues, in addition to volunteering at Mana’O Radio. The University of Hawai’i Institute for Astronomy (IFA) participates in Satellite Laser Ranging, which is the process of obtaining satellite position data from the roundtrip time of an ultrashort laser pulse. A powerful laser located at the Transportable Laser Ranging System-4 site is used for this process, and it must avoid adjacent air traffic. To protect air traffic, staff, called spotters, observe the sky and stop the laser when needed. In order to assist spotters, plane position data that is broadcast at 1090MHz, known as Automatic Dependent Surveillance-Broadcast(ADS-B) data, has been used by consumer and commercial grade equipment to plot air traffic. However, both consumer and commercial ADS-B tracking systems have drawbacks such as not plotting in real-time, or lacking customization capability due to the required use of proprietary software. This project solved these limitations by designing and building a custom system using consumer hardware and open-source software to meet the IFA’s needs and serve as a flexible, cost-efficient alternative. The receiver system was made from an antenna that connected to a software-tunable radio receiver dongle tuned to 1090Mhz, and a Raspberry Pi running the open source program, dump1090. ADS-B data was then processed by an existing calculation software, which was translated from Fortran into C, and had its output stage reconfigured for use with a modified Graphical User Interface (GUI). The final system plots plane data to a Linux application in real-time using a sky plot view, and also lists the data of each plane in a table. The program provides spotters with a nearby plane’s azimuth, elevation, latitude, longitude, and distance, as well as auditory notifications. This virtual radar system is planned to be implemented as a form of assistance for spotters on the summit of Haleakala after final tests have been conducted by IFA staff. In the future, updates could be made such as, including flight numbers for commercial airlines, plotting the laser’s current pointing angle, or even reworking the GUI into a web-based program.